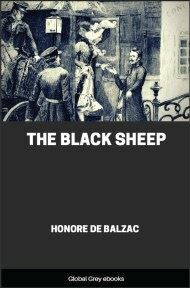 The Black Sheep (also published under earlier titles of 'A Boy of Household' 'The Two Brothers' and 'A Boy Cleaning') tells the story of the Bridau family, trying to regain their lost inheritance after a series of unfortunate mishaps. 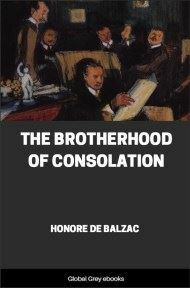 It is part of the La Comedie humaine series of books written by de Balzac. In 1792 the townspeople of Issoudun enjoyed the services of a physician named Rouget, whom they held to be a man of consummate malignity. Were we to believe certain bold tongues, he made his wife extremely unhappy, although she was the most beautiful woman of the neighborhood. Perhaps, indeed, she was rather silly. But the prying of friends, the slander of enemies, and the gossip of acquaintances, had never succeeded in laying bare the interior of that household. Doctor Rouget was a man of whom we say in common parlance, "He is not pleasant to deal with." Consequently, during his lifetime, his townsmen kept silence about him and treated him civilly. His wife, a demoiselle Descoings, feeble in health during her girlhood (which was said to be a reason why the doctor married her), gave birth to a son, and also to a daughter who arrived, unexpectedly, ten years after her brother, and whose birth took the husband, doctor though he were, by surprise. This late-comer was named Agathe. 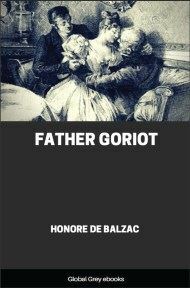 These little facts are so simple, so commonplace, that a writer seems scarcely justified in placing them in the fore-front of his history; yet if they are not known, a man of Doctor Rouget's stamp would be thought a monster, an unnatural father, when, in point of fact, he was only following out the evil tendencies which many people shelter under the terrible axiom that "men should have strength of character,"—a masculine phrase that has caused many a woman's misery. The Descoings, father-in-law and mother-in-law of the doctor, were commission merchants in the wool-trade, and did a double business by selling for the producers and buying for the manufacturers of the golden fleeces of Berry; thus pocketing a commission on both sides. In this way they grew rich and miserly—the outcome of many such lives. Descoings the son, younger brother of Madame Rouget, did not like Issoudun. He went to seek his fortune in Paris, where he set up as a grocer in the rue Saint-Honore. That step led to his ruin. But nothing could have hindered it: a grocer is drawn to his business by an attracting force quite equal to the repelling force which drives artists away from it. We do not sufficiently study the social potentialities which make up the various vocations of life. It would be interesting to know what determines one man to be a stationer rather than a baker; since, in our day, sons are not compelled to follow the calling of their fathers, as they were among the Egyptians. In this instance, love decided the vocation of Descoings. He said to himself, "I, too, will be a grocer!" and in the same breath he said (also to himself) some other things regarding his employer,—a beautiful creature, with whom he had fallen desperately in love. 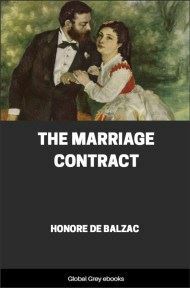 Without other help than patience and the trifling sum of money his father and mother sent him, he married the widow of his predecessor, Monsieur Bixiou. In 1792 Descoings was thought to be doing an excellent business. At that time, the old Descoings were still living. They had retired from the wool-trade, and were employing their capital in buying up the forfeited estates,—another golden fleece! 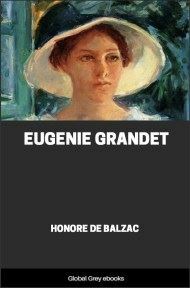 Their son-in-law Doctor Rouget, who, about this time, felt pretty sure that he should soon have to mourn for the death of his wife, sent his daughter to Paris to the care of his brother-in-law, partly to let her see the capital, but still more to carry out an artful scheme of his own. Descoings had no children. Madame Descoings, twelve years older than her husband, was in good health, but as fat as a thrush after harvest; and the canny Rouget knew enough professionally to be certain that Monsieur and Madame Descoings, contrary to the moral of fairy tales, would live happy ever after without having any children. The pair might therefore become attached to Agathe. That young girl, the handsomest maiden in Issoudun, did not resemble either father or mother. 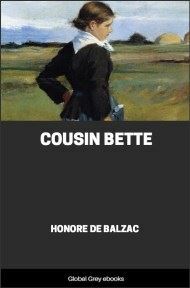 Her birth had caused a lasting breach between Doctor Rouget and his intimate friend Monsieur Lousteau, a former sub-delegate who had lately removed from the town. When a family expatriates itself, the natives of a place as attractive as Issoudun have a right to inquire into the reasons of so surprising a step. 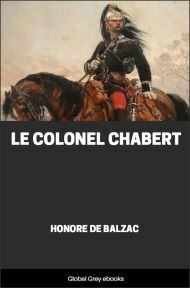 It was said by certain sharp tongues that Doctor Rouget, a vindictive man, had been heard to exclaim that Monsieur Lousteau should die by his hand. Uttered by a physician, this declaration had the force of a cannon-ball. When the National Assembly suppressed the sub-delegates, Lousteau and his family left Issoudun, and never returned there. After their departure Madame Rouget spent most of her time with the sister of the late sub-delegate, Madame Hochon, who was the godmother of her daughter, and the only person to whom she confided her griefs. The little that the good town of Issoudun ever really knew of the beautiful Madame Rouget was told by Madame Hochon,—though not until after the doctor's death. The first words of Madame Rouget, when informed by her husband that he meant to send Agathe to Paris, were: "I shall never see my daughter again." "And she was right," said the worthy Madame Hochon. After this, the poor mother grew as yellow as a quince, and her appearance did not contradict the tongues of those who declared that Doctor Rouget was killing her by inches. The behavior of her booby of a son must have added to the misery of the poor woman so unjustly accused. Not restrained, possibly encouraged by his father, the young fellow, who was in every way stupid, paid her neither the attentions nor the respect which a son owes to a mother. Jean-Jacques Rouget was like his father, especially on the latter's worst side; and the doctor at his best was far from satisfactory, either morally or physically.